welcome to this months book corner. I love rhyming and rhymes, not only are they fun and sound great but they are the initial step in learning to read. My family has always made up simply crazy rhymes around names e.g. I am auntie Catie Pat-hay-tee to my brothers children (will you ever look at me the same again?) even our dog is Nova Bova Wova. Research has proven that sensitivity to rhyme helps children with reading as it helps them to detect the individual sounds within words and therefore develop their phonetic knowledge. Children who are good at detecting rhyme will be more successful and quicker in learning to read (Bradley, 1988c, Bradley & Bryant, 1983, Ellis & Large, 1987). 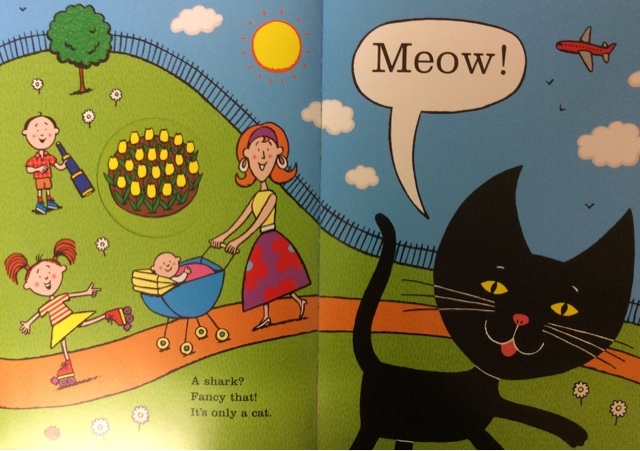 This months book is full of rhyming fun and your little ones will love it! 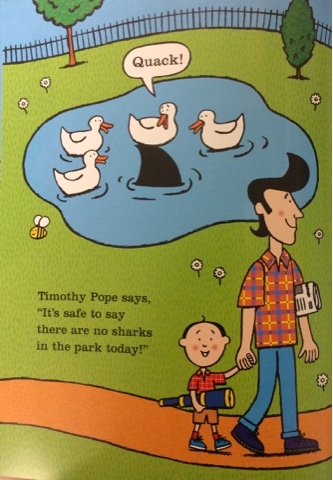 Shark in the park is the tale of Timothy Pope. A little boy with a brand new toy. 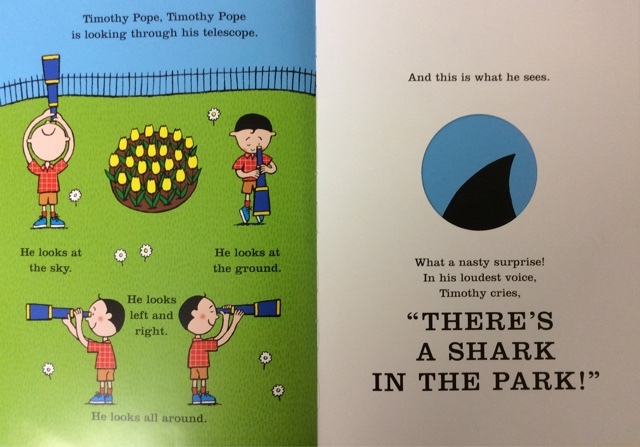 Desperate to try out his new telescope he ventures down to the park but each time he looks through it he is shocked to discover a shark's fin. 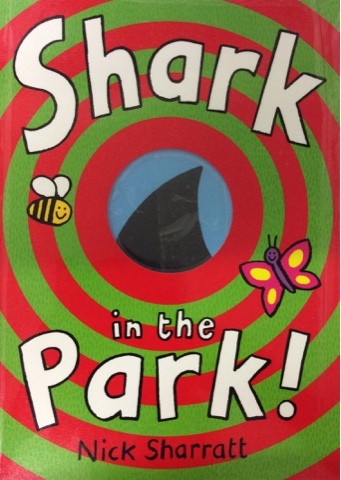 Of course it isn't actually a shark's fin at all and you can have great fun with your child guessing what it might be. 'The ending of the book provides an ingenious twist in the tale that all children will love. The book uses repetition, a great way to get children joining in. Spend some time getting your children to pick out the rhymes or pause so that they fill them in for you. If you have the time cover them up with blue tack and reveal. Discuss with your child: What do you think could happen next? What makes this book stand out for me are the amazing illustrations. I love the drawing style of Nick Sharrat, he is a prolific illustrator, I am sure you will have seen his work before as he has illustrated books for authors including; Julia Donaldson, Jeremy Strong, Michael Rosen, Giles Andreae, Kaye Umansky, Kes Gray and most notably Dame Jacqueline Wilson and also written around 40 of his own books. I have used his drawings many times to demonstrate to children how to draw people. Perhaps you could try that too? This is a really fun rhyming book that provides plenty of opportunities for children to join in and the stunning illustrations make it even greater, definitely one for the family bookshelf!